Round Bottom Trench Drains are available from StainlessDrains.com in 304 and 316 stainless steel. Round bottom drains are effective for applications that require increased flow resulting in reduced bacteria and contaminant build-up. 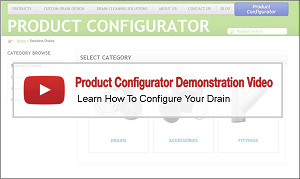 StainlessDrains.com serves the foodservice, plumbing and construction industries. All drains manufactured by StainlessDrains.com are custom fabricated in our U.S. plant to meet each customer’s needs. Round Bottom Trench Drains can be manufactured to industry standard or custom specifications. Standard starting depth of 4" or 6"
T-sections or 45°/90° turns are custom designed for any installation that requires joining two or more drain sections. Slot, perforated, perimeter gap and heavy duty bar grating is available. Round trench drains can be shipped in sections up to 50’and can be field-welded up to any length required. All drains are manufactured in the U.S. at our Texas plant to custom specifications. Our drain specialists work to design and manufacture the most effective drain configuration for the customer’s application, whether it is a new application or a replacement for an existing trench drain system. Delivery dates are usually within 14 days of receiving the order. Our 20 years of experience designing and manufacturing drains ensure that we deliver a high-quality drain system at a competitive cost to our clients.